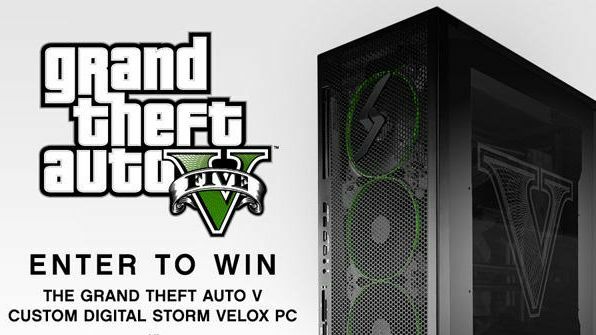 To coincide with the release of Grand Theft Auto V on PC, Rockstar is giving you a chance to win a one-of-a-kind desktop PC that will easily run the game in 4K at a blistering 60 frames-per-second. It's taken a while, but Grand Theft Auto V is finally available on PC. The game originally launched on PS3 and Xbox 360 in September 2013, before being released on PS4 and Xbox One a year later in November 2014. PC gamers have had to be patient to get their hands on the open-world title, so Rockstar is going to reward a lucky one with a seriously cool set-up. To mark the release of the game, the publisher is giving away a GTA 5-themed PC that has more than enough spec-wise to run the game at its maximum capabilities. We'd be surprised if you current PC matches up. This special edition beast packs a six-core Intel i7 5930K, a 750 series SSD, 32GB of DDR4 RAM, two Nvidia Titan X cards, and liquid cooling. Hand-crafted by Digital Storm, the design features a sating metallic black automotive paint finish, a laser engraved tinted windows showcasing the GTA 5 logo plus software controlled LED lighting. This Velox Custom Performance PC is a real catch, and will certainly look the part on your desk. You can enter from now until May 1 at the Rockstar Social Club website. The full rules can be found here, but you will need to be 18 or older to win.